When I started thinking about resampling and the filters used in resampling I leaned heavily on the book by P. P. Vaidyanathanm, "Multirate Systems And Filter Banks", the "brown book" that every signal processing practitioner should have on his or her shelf (or on a shelf of a nearby colleague)! Like many articles discussing this topic (e.g. 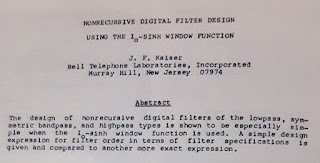 the documentation of this MATLAB function), the key paper always referenced is Kaiser, James F. “Nonrecursive Digital Filter Design Using the I0-Sinh Window Function.” Proceedings of the 1974 IEEE International Symposium on Circuits and Systems. April, 1974, pp. 20–23. 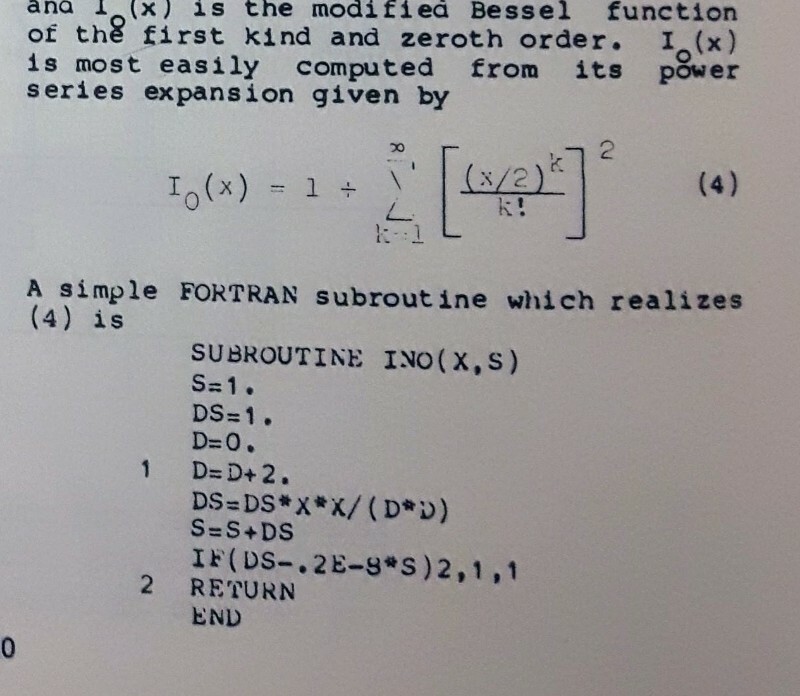 Being curious about how the equations given in Vaidyanathanm were derived, I wanted to see the original paper - but unfortunately, the earliest proceedings of ISCAS that can be found in IEEE Xplore are from 1988 - 14 years after the one I'm after. Luckily, I happen to be on Christmas vacation at my inlaws, which live in Kitchener, which is right next door to Waterloo - home to one of the best engineering universities of the world. Unsurprisingly, they have a well-stocked library, which includes the above conference proceeding booklet and, braving the cold, I now have a copy for my own archives. I could only copy it by taking snaps using my cellphone - the copiers need a special card to use, and the scanners need a UWaterloo login, but for reading the content, that is sufficient with today's smartphones. It's only for personal use, and I do hope that the IEEE will eventually get around to scanning in the older papers! So there's one item off my list of things to to in 2018. Visit the UWaterloo Campus and its library. Good fun. 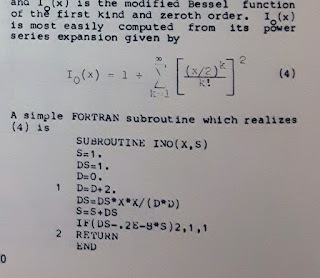 The FORTRAN IF statement: That is known as the "arithmetic IF" or "three-way IF" statement. The expression after the IF is evaluated, and if it is negative, the execution jumps to the first label ("2", exiting the subroutine). If the result is 0, we go to the second label ("1"), and if it is positive, to the third (also "1"). Here, each term of the power series expansion is calculated, and as soon as the new term is less than 2x10^-9 of the approximation, the code terminates. 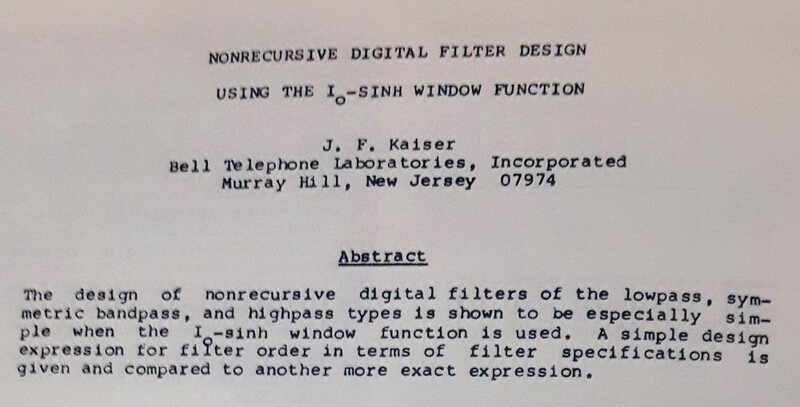 And IIRC, FORTRAN is call-by-reference.